i highlighted the first downbeat of the measure where the time signature changes by left clicking in the white space above the mp3 file where the downbeat peak was and dragging the white selection area thing(forgot what its called) to the first downbeat of the next measure , which would be the 2nd downbeat or the 2nd "1" of this new time signature change. i then right clicked inside the selection area and the RBN docs said to click "create measure from time selection(new time signature)(detect tempo), but after i entered the new time signature it skipped a measure on the tempo map(measure 42) and in the midi editor it doesnt have measure 43 labeled. i just left clicked on top of my marker im not sure if thats accurate enough? Deleting that marker should set it back to normal. There's probably an easier way for going from shorter time signature to longer ones, but this is my method. 1. Bar 3 here is in 4/4, but say the song changes at bar 4 to 6/4. Double click the "T" Tempo marker where my mouse is. 2. 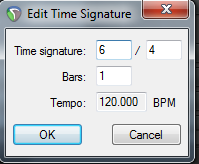 This window pops up, fill out the time signature as 6/4 and make sure to check off "Set time signature"
3. Should now look like this. Now just line up your mouse with the downbeat of the next bar (5), but instead of "Q" hit "T" on your keyboard. 4. Another window pops up, fill it out as 6/4 once again and click OK.
You can just use the "time selector" (the vertical bar you can move and whatnot in the track mixer, as show in the 3rd point in the previous post). 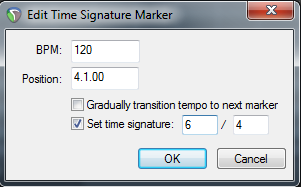 Just select the place where you want to change time signature then right click on the arrow at the top of the vertical line and select > create time signature marker. IIRC Alt+Clicking a tempo/time signature marker will delete it. thanks very much guys problem fixed now!